About three months ago, we kids had been plotting something special to do. It was Mum and Dad’s 70th birthday and their 40th wedding anniversary – this doesn’t come around too often!. 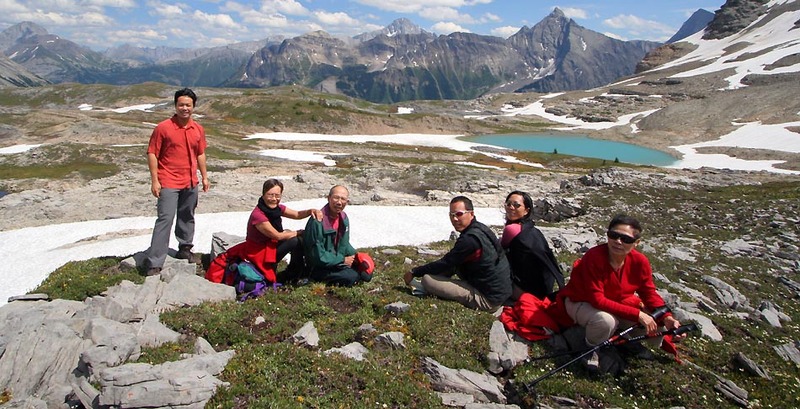 Although their time of hiking big elevations and long distances was now over, they still loved getting into the alpine and seeing the mountains. 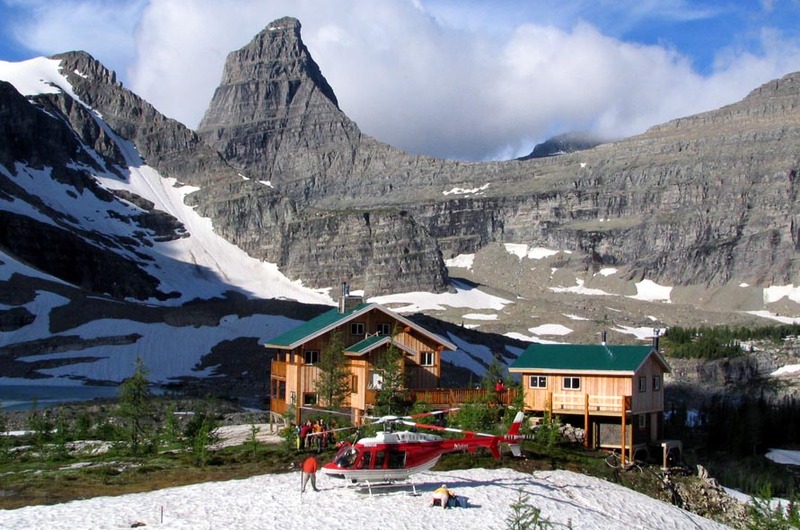 After researching some heli-hiking outfits, we had settled on a relatively new outfit called Talus Lodge. 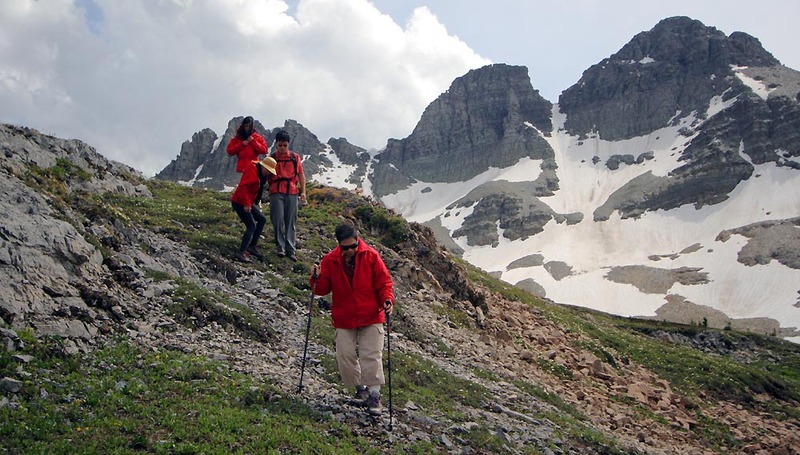 They were reasonably priced, located at high elevation (important because we wanted to minimize the amount of slogging to get to the alpine for older folks) and came with good recommendations. Our aunt Hee Lee (who us kids call Kor Kor) is super close to us. She moved to Canada a short time after we came here and now lives in Calgary. 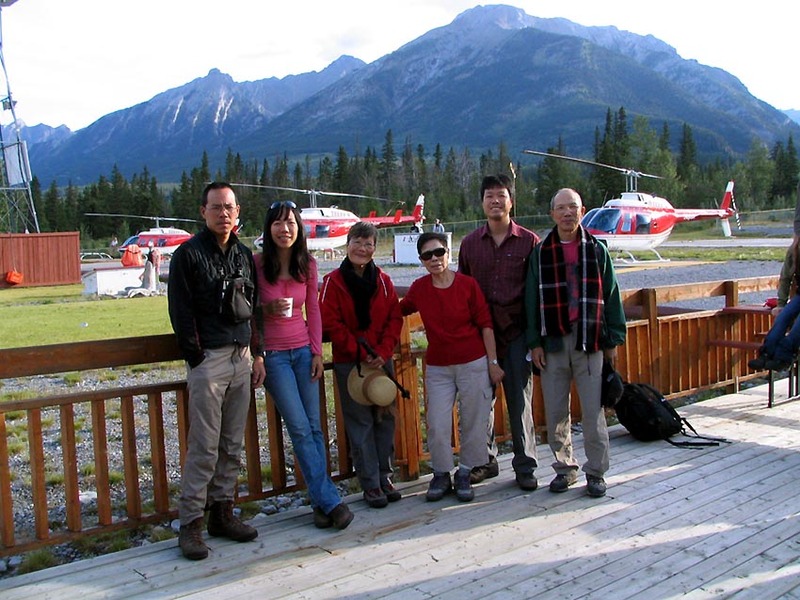 We thought it would be a good surprise and a fun treat to spring for Mum, Dad and Kor Kor to go heli-hiking. It turned out to be a good choice of location, venue and weather. 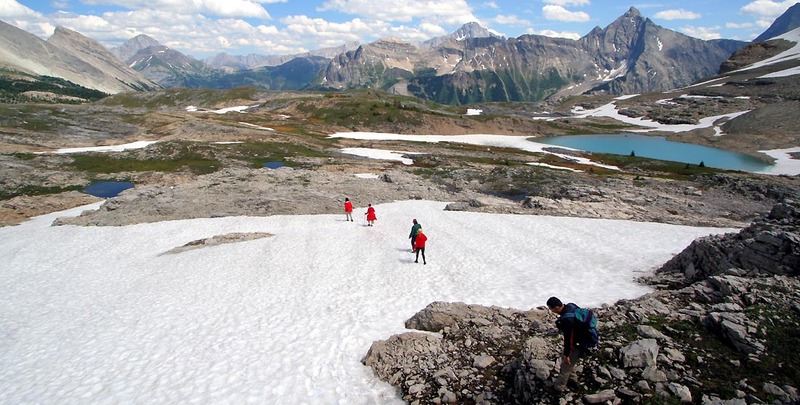 Although the heavy snow year meant that there were still the odd patches of snow in the alpine (we hiked around the 2100m to 2300 metre marks – which is pretty high), the snow and ice leant to the ambience and beauty of the area. 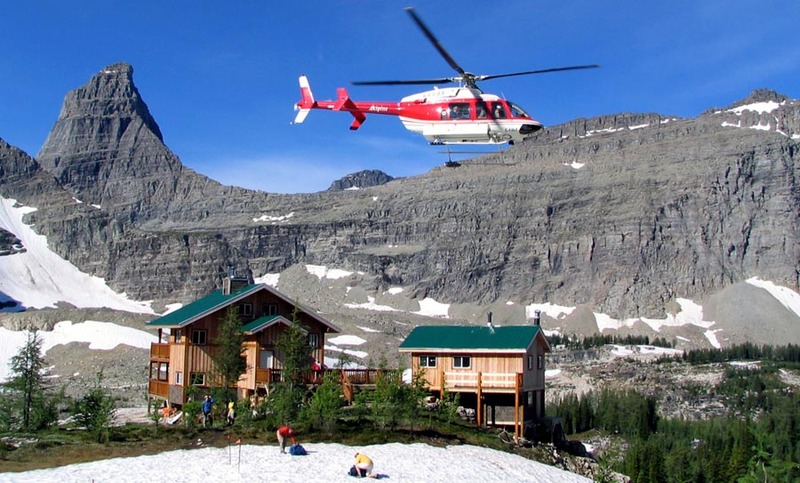 Landing at Talus Lodge – yes there still is snow here at about 2120m elevation! I honestly didn’t know what to expect. This is a seldom-visited area of the Rockies and there isn’t that much information about the area. When we had a chance to speak to the lodge-owner/operator, Chris Espinell, it turns out that he had decided to build and locate the lodge there with his business partner, precisely because it was beautiful and rarely visited. Again, this is a pretty stunning location. 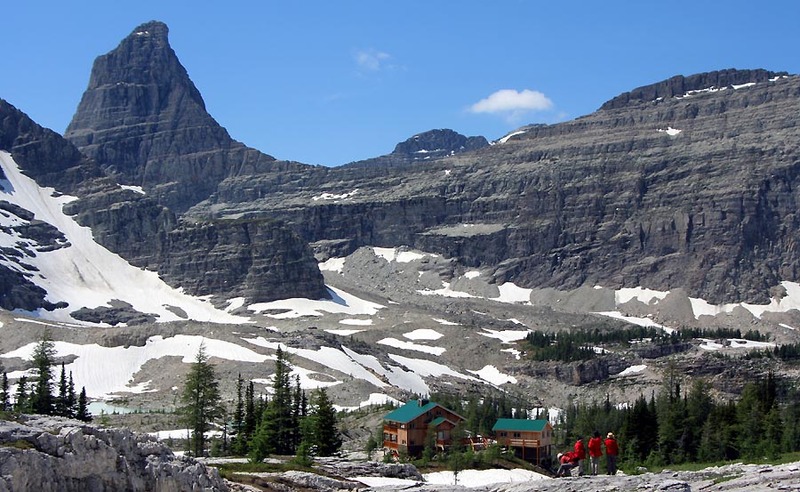 The lodge is built at a pretty high elevation compared to other alpine lodges and even though it is close to many other stunning and more well-known wilderness areas in the Rockies, it is rarely visited. 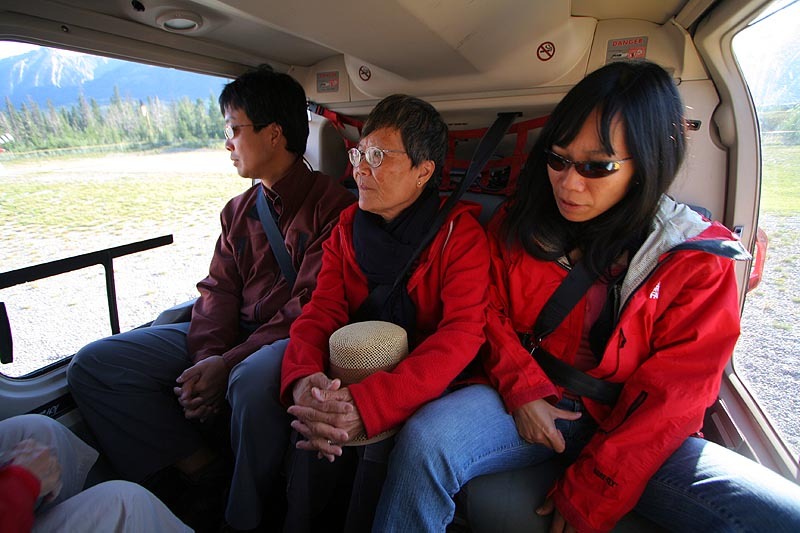 The heli-flight from Canmore was quite the treat for all of us as the weather was so nice. 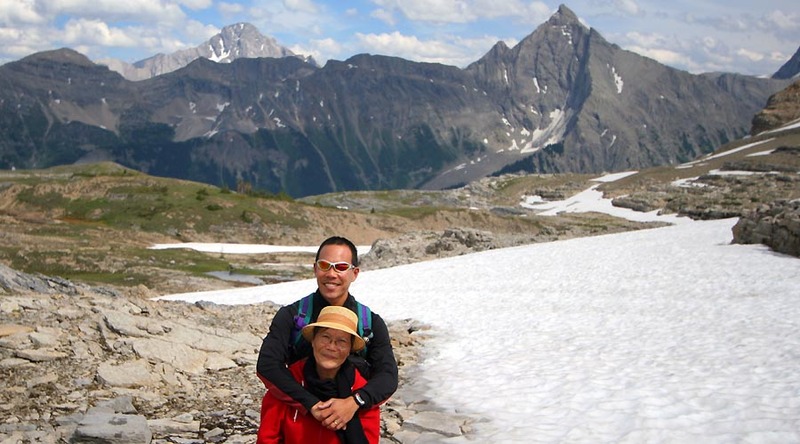 Of course, Dad got the front seat and had a thoroughly good time looking at all the peaks and hike him and Mum had done when they lived in Calgary. 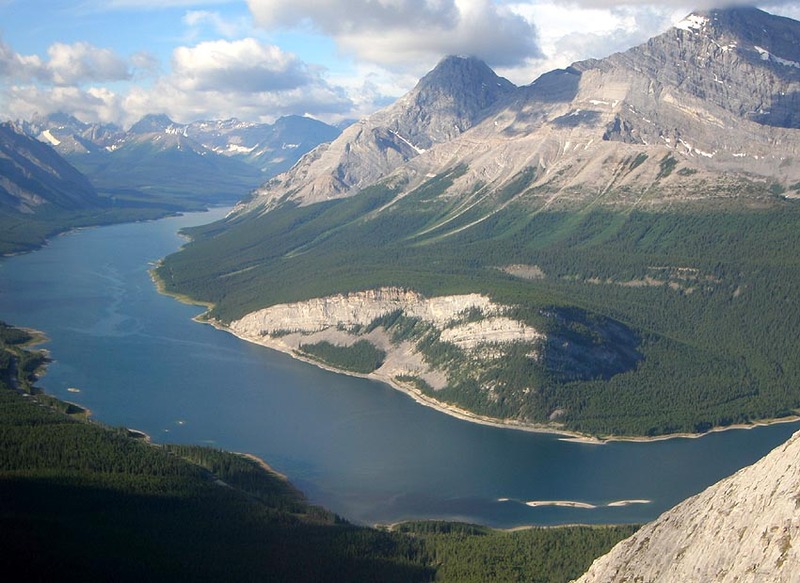 We flew from Canmore down through the Spray Lakes valley then through the pass between Vavasour and Currie then the White Man – Vavasour pass and to the lodge. We were set down in late morning and after stuffing our faces with a prepared lunch, went for a hike west of the lodge to Ptarmigan Plateau. Our short jaunt east of the lodge to Ptarmigan Plateau covered roughly 4kms out and back and was pretty flat on undulating ground. Perfect for aged knees! We took our time and explored. 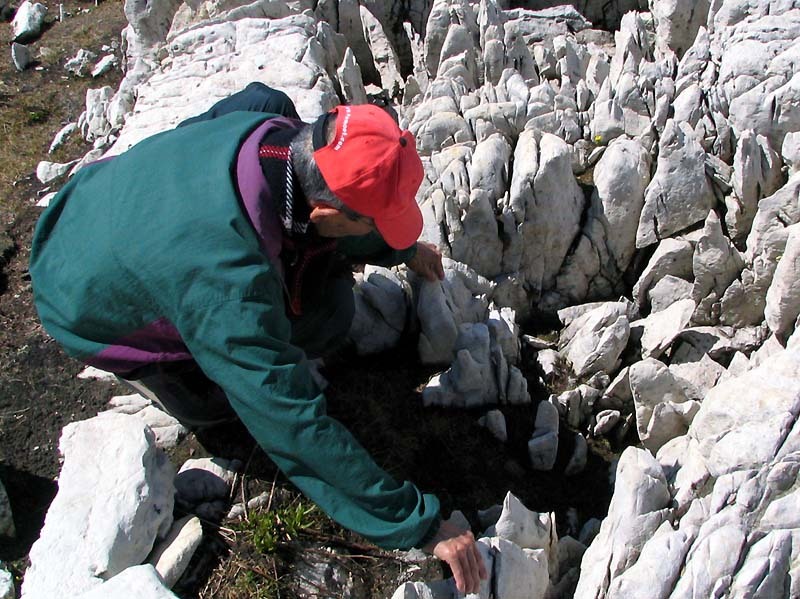 Dad in particular was fascinated by the limestone that had been eroded by alpine streams flowing through and undercutting the rock. 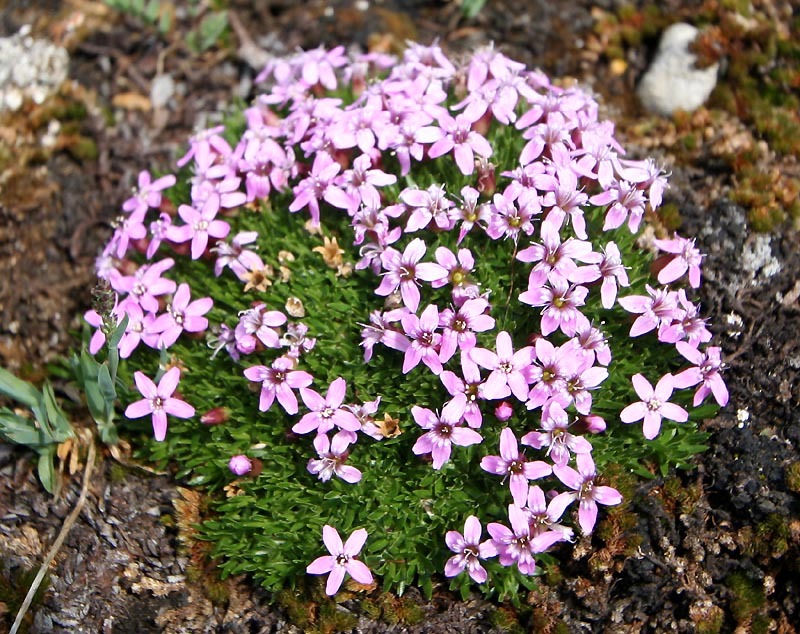 Of course, there were tons of alpine flowers and that made Mum very very happy. 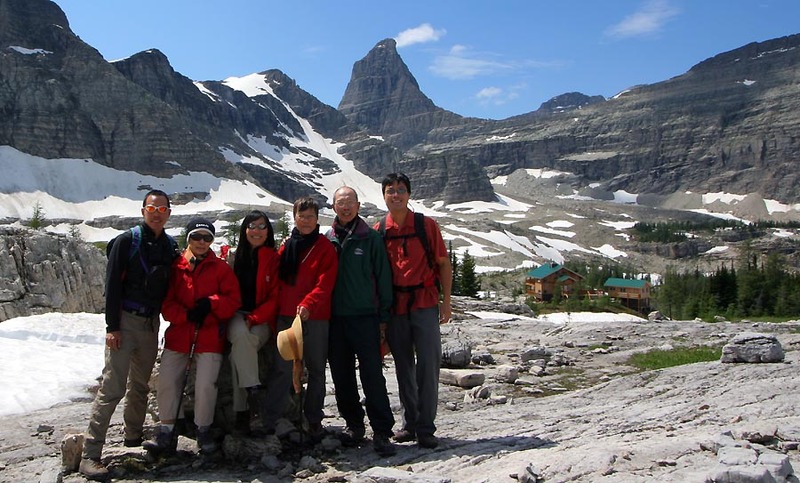 Us kids weren’t sure how well the parents and Kor Kor would do with alpine hiking, especially given that it was at altitude. It turned out that we didn’t have to worry as they all had their own consistent pace. We carried the gear and pottered along quite merrily along this beautiful plateau, eventually making our way to viewpoints where we could look east over the Spray River valley to the Royal Range and Sir Douglas to the east, the Kananaskis Range to the north east and to Burstall Pass – directly opposite our viewpoint also to the east. Although we started out a bit late in the day and was a short hike, we weren’t rushed at all and covered a fair amount of ground. The weather held up well and we got a good taste of the views to come. Some un-named alpine lakes on the Ptarmigan Plateau. Heading back to the Lodge now going west on the Plateau. Royal Ridge is the snow-covered slope in the background and is north of us. Kor Kor, Mum and Dad did great on the loose rocky scrambles!